If you are looking for Custom Printed Calendars or Customized Calendar Printing for your promotional use or any other use, you have come to the right place. Custom Calendar Printing is what we do. We are confident that we can assist you with Custom Calendar Printing, Customized Calendars and Full Custom Calendars. We can brake it down into three main categories: Stock Personalization Calendars, Partially Custom Calendars and Full Custom Calendars as described here below. 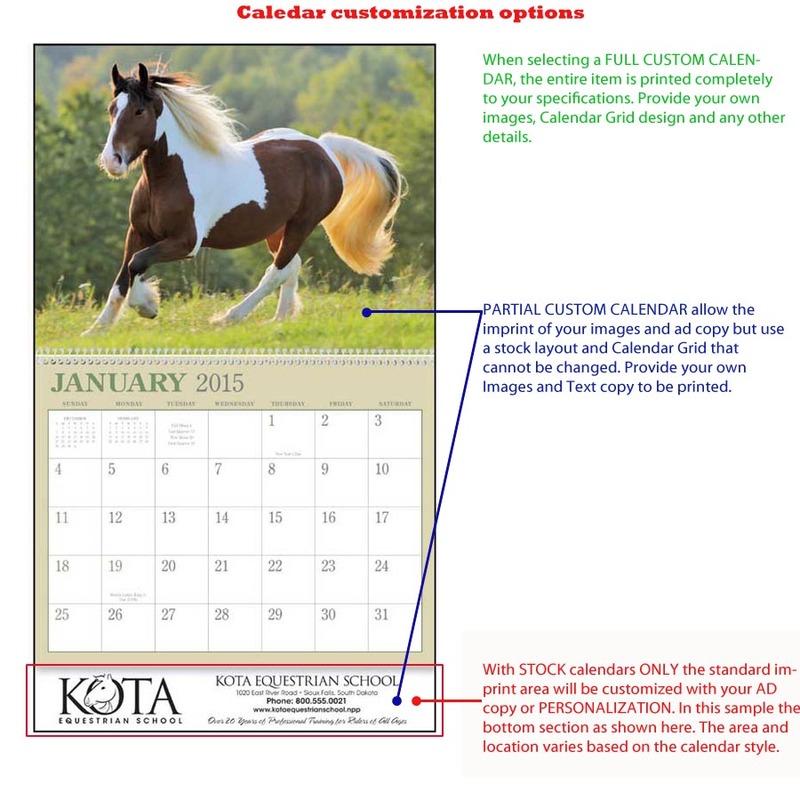 When selecting a Full Custom Calendar, the entire item is printed completely to customer art and specifications. Customer to provide Images, Calendar Grid design and any other details. Partial Customization allows the imprint of your images and ad copy on a stock layout and stock Calendar Grid that cannot be changed. Provide your own images and text copy to be printed. With Stock Calendars only the standard imprint area will be customized with your AD copy or Personalization. In the sample on this page, is the bottom portion of the page as shown. The area and location varies based on the calendar style. What are Calendars with Stock Personalization? These are Pre-Printed calendars with a blank area on the page or Back Flap that are then printed with your company Logo and Information. These calendars come in a variety of subjects/themes: Religious, Landscapes, Gardens, Homes, Cars, Animals, Trucks, Motivational and much more. The images and design details are not changeable thus partial-custom calendars. On some styles Partial Customization can include the printing of your custom images using a stock grid layout and calendar format. These include SINGLE image and MULTIPLE images options.